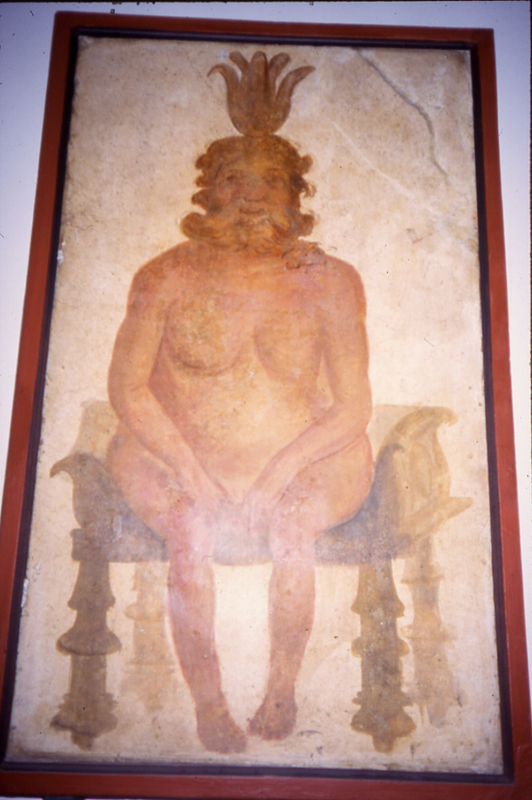 Image of Bes from Napoli Museum. Bes’ image adorns many of the coins found at Pompeii. Normally, the coins archaeologists find are those that have been lost or purposely hoarded away. The Pompeii collection is quite different from coins found elsewhere. For perhaps the first time, we have a good idea of a collection in everyday use. Over the centuries 1000s of coins have been excavated at Pompeii. Many are poor quality, well-worn, nasty-looking bronze pieces. Rather emotively, the silver and gold coins tend to be found on the bodies of people fleeing from Pompeii – clearly the doomed wanted to take their treasure with them. Of course, there were certainly other gold or silver coins in circulation: it is possible that these were looted or retrieved by people who returned to Pompeii after the disaster. So, in all likelihood, the picture we get from the coins found in excavations is somewhat skewed. Despite this, studying the ugly copper coins is hugely important, and provides illuminating insights to the ancient economic life of Pompeii. British Museum coins specialist Richard Hobbs is working on the coins recovered by Rick Jones’ excavations, of which there around 1,000 have been found to date. Although his research is in its early stages, he has already made some fascinating discoveries. Most notable is his finding that out of all the types of coins so far identified from Pompeii, two types feature most often. These are poor-quality coppers that copy specific types made in two places: Ebusus (modern Ibiza) and Massalia (modern Marseilles in France). As you can see from the accompanying illustrations, the images on the imitation coins tend to be schematic, bowing only a distant nod to the originals. Many seem to have been in circulation for a long time since they are bashed around and in a poor state. These derivative, or ‘pseudo’, coins are probably locally-made. Though no mint, nor even portable coin-die, has yet been found in Pompeii, the pseudo-Ebusus and pseudo-Massalia coins are not generally found outside the bay of Naples. In all likelihood, these ‘pseudo’ coins were just for use in the local economy. The fact that so many have been found bears out the degree to which the people of Pompeii were involved in local trading. 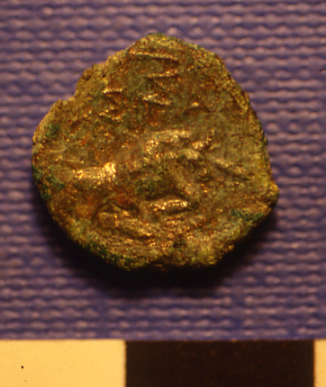 The large numbers of local coins also suggests that the Pompeiians may have been using a largely monetised economy rather than other forms of barter. That far fewer coins come from further afield, for example actually from Ibiza or Marseilles, suggests that the people of Pompeii were not engaged in very much monetised longer-distant trade. The excavations by the Bradford team represent one of only a few cases where the coins from Pompeii are being comprehensively recorded from well-stratified contexts. Once this collection has been fully-studied, it will provide a privileged picture of what was circulating at which times. This in turn will help inform interpretations of how Pompeii fared and operated over the centuries before its tragic end. At present, research into the coins is at an early stage. Many are unidentifiable since they are so well worn, while others are yet to be catalogued. So far, 505 of about 1000 coins found in the Bradford excavations at Pompeii, have been identified. Here we illustrate the four main types of coins found by the Bradford team. 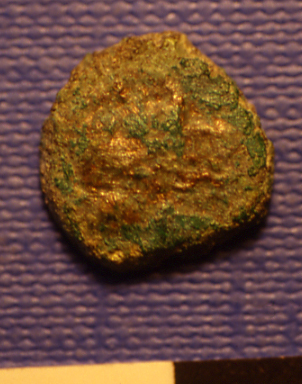 A typical ‘Bes’ or pseudo-Ebusus coin. A poor imitiation of a Bes coin. The Bradford excavations have produced over 100 such coins so far (approximately 22% of the entire assemblage). Most are pseudo-Ebusus (about 5% of those found are original Ebusus coins). Both original and copy tend to be 12-16mm in diameter and date to the late 2nd to early 1st century BC. Each side of the Ebusus features the figure of the rather grotesque-looking Egyptian dwarf god Bes, the god of dance (so, not dissimilar to the clubbers’ dance cult followed in Ebusus, modern Ibiza, today!) 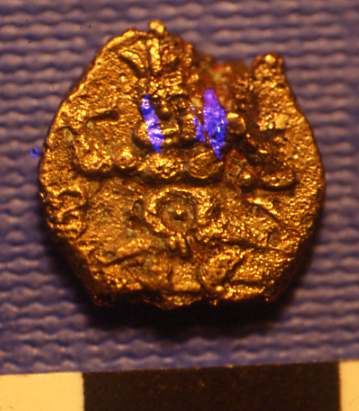 The pseudo-Ebusus coin, typical of the Pompeii collection, carries an abstract design of Bes. 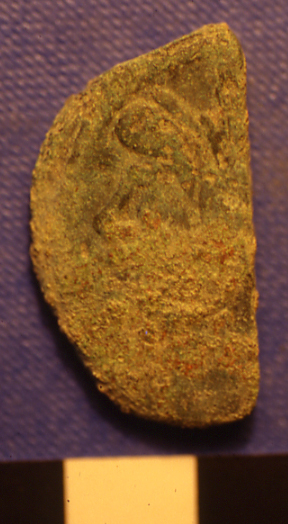 A typical halved Janus head/ship prow coin. Reverse. 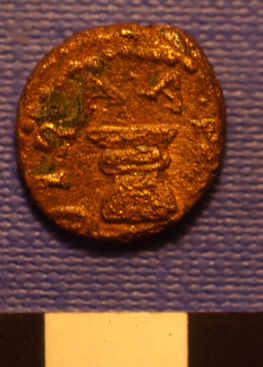 A typical halved Janus head/ship prow coin. Obverse. About 45 of these have been recorded to date (about 9% of the total assemblage). This larger copper-alloy coin is usually about 25-39mm in diameter, with a Janus’ head on one side, and the prow of a ship on the other. 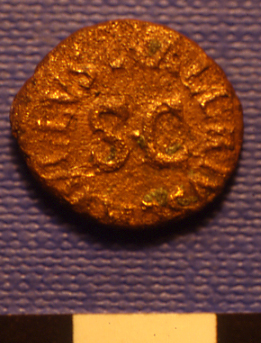 Sometimes this type carries the word ‘ROMA’ and are a standard Rome issue, made during the Republic, and are found all over Italy, and date to the 1st century BC. Many are found halved, which was undoubtedly done to literally halve their value and make them into smaller change. This also happened to silver coinage elsewhere in antiquity. 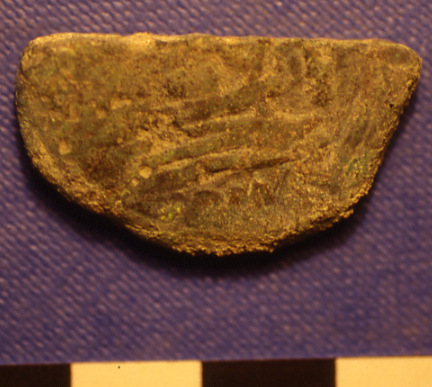 For example, in Medieval England half-pennies and quarter-pennies were exactly that, pennies cut into halves or quarters. 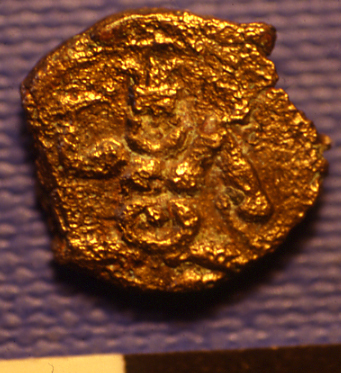 A ‘pseudo-Massalia’ coin with butting bull on reverse. To date, 55 coins have been recorded (around 11% of the collection). This copper-alloy type tends to be about 11-13mm in diameter, with the head of Apollo on the front and abutting bull on the reverse. Again, only a handful are from Massalia (modern Marseilles in France), most are schematic imitations, and are probably local coins. They seem to date to the 1st century BC. Early Imperial quadrantes, probably an imitation. Reverse. An early Imperial quadrantes, probably an imitation. Obverse. Eighteen of these have been found, which represents about 3% of those identified so far. However, Richard Hobbs strongly suspects that more will emerge once he has looked at the entire collection. These coins tend to be 17-18mm in diameter, and sometimes show a corn-container on one side, and a distinctive ‘S C’ on the other (‘by order of the senate’), with a long legend running around the edge of each side in neat lettering. They date from the late 1st century BC to the early 1st century AD. Source: Richard Hobbs, Curator of Romano-British Antiquities, The British Museum.